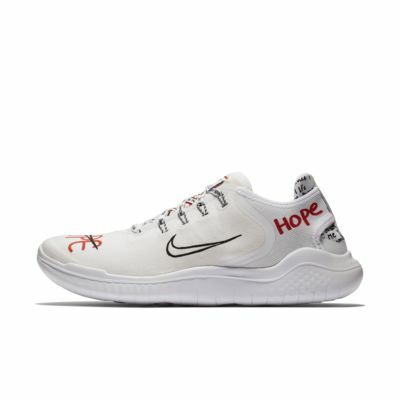 The Nike x Novo Free RN 2018 T-Shirt for Your Feet Men's Running Shoe combines a lightweight, breathable construction with the classic cushioning and flexibility of a Nike Free midsole for lasting comfort during your run. This limited edition features unique design details created by artists and inspired by the cities they live in. The Nike x Novo Free RN 2018 T-Shirt for Your Feet Men&apos;s Running Shoe combines a lightweight, breathable construction with the classic cushioning and flexibility of a Nike Free midsole for lasting comfort during your run. This limited edition features unique design details created by artists and inspired by the cities they live in. The city of Seoul never sleeps and never slows down. To keep pace, visual artist Novo works hard and fast, which leaves him with a constant sense of fatigue. It also brings him hope. Because at the end of each day, that rewarding, welcome fatigue means he&apos;s made big strides towards his dreams. Novo&apos;s paper-aeroplane graphic symbolises the speed, freedom and hope he experiences every day in Seoul.